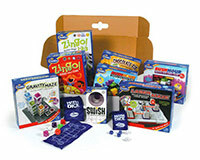 Team up with ThinkFun and have a STEM + Families ThinkFun Game Night at your school! What is a STEM + Families ThinkFun Game Night? Shows everyone that learning can and should be fun! How Can My PTA Host a ThinkFun Game Night? New! Check out this How to Host a Game Night resource. It covers steps on how to host an event and includes tips from past grantees. Promote your Game Night to students and families using this flyer template from ThinkFun! ThinkFun gave 50 lucky PTAs a game bundle that includes 36 games for the day of play and 6 prize-pack games for event prizes and incentives! 100 PTAs also received a two-game prize pack. View the 2018 ThinkFun Game Night Giveaway Winners! If you don't receive the grant or if you want to purchase additional games, ThinkFun is offering special discounted rates for PTAs. Simply fill out the order form below to get incredible deals on games that you can use to host your own Game Night. Questions Regarding Hosting your Family Game Night? Listen to a local PTA in Georgia share their amazing experience hosting their Family Game Night by watching the STEM + Families Family Game Night webinar.